Free Water Resistant Staining with a new deck build over 100 sq. Ft.
ABC Deck installation has increased in popularity in recent years among homeowners in Alexandria, VA, Fairfax, VA, and the surrounding areas. A deck transforms your backyard environment and provides space for entertaining or just relaxing. ABC Design & Build offers custom deck building to create the perfect deck to accentuate the style of your home in a design that meets your unique needs. We have built more custom decks than we can count over the past 25 years and we have the expertise to design and install decks of all types and sizes. We begin by getting an idea of how you want to use the space and provide the advice you need about design and materials to help you make an informed decision for your home. At ABC Design & Build, we provide comprehensive services for custom decks to add an element of style to your outdoor living space. 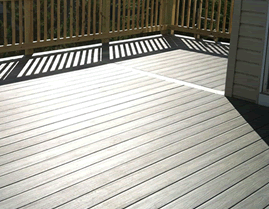 Whether you want to improve your existing deck or add a custom deck to your home, we can help. Our services include custom deck building, custom deck design and deck installation, deck staining, and deck power washing. If you have been considering adding a custom deck to your home in Alexandria, VA Fairfax, VA Fairfax, VA, we offer decades of experience and a commitment to excellence for your project. Please contact us by telephone or complete our online form to request a free estimate for your new deck. We service all of the areas below and more. To schedule a free estimate in your area click on the links below. Thanks again for considering ABC Design and Build to transform your home. We understand you have a difficult yet exciting decision to make. We are simply here to provide professional advice in a pressure free environment.